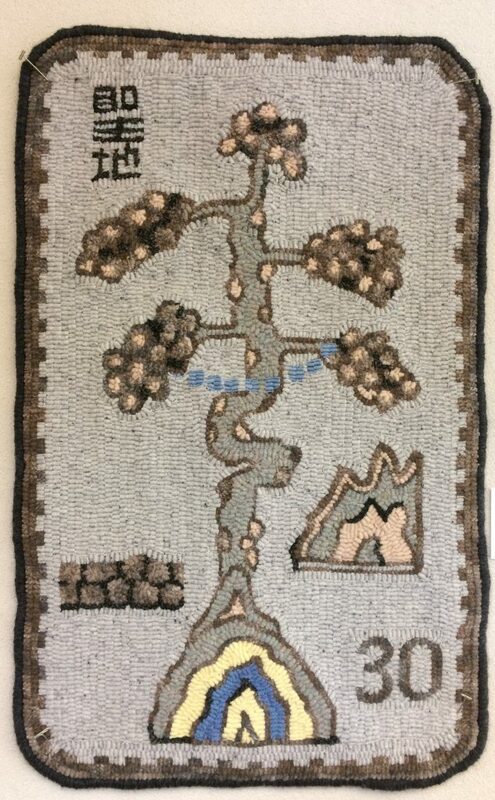 Here is the first photo of a rug that is missing from my earlier post! 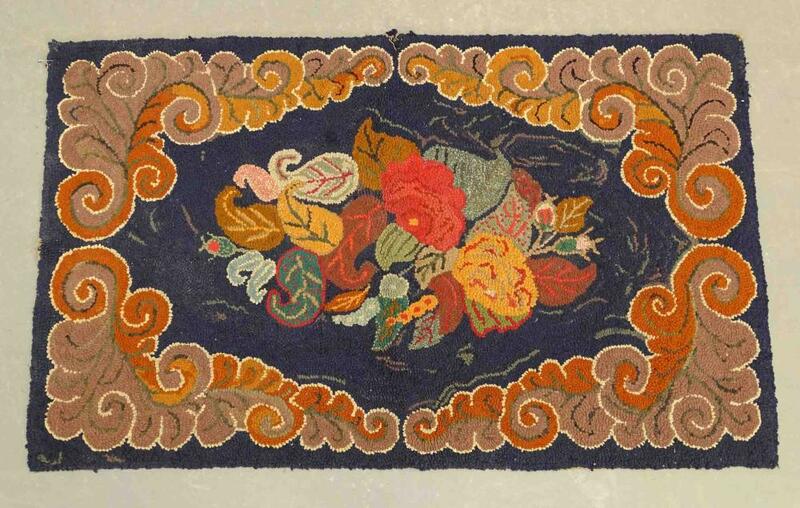 Above, you see a nice old rug, going on sale this Saturday (Nov. 24, 12 pm) at Copake Auctions in Copake, NY. 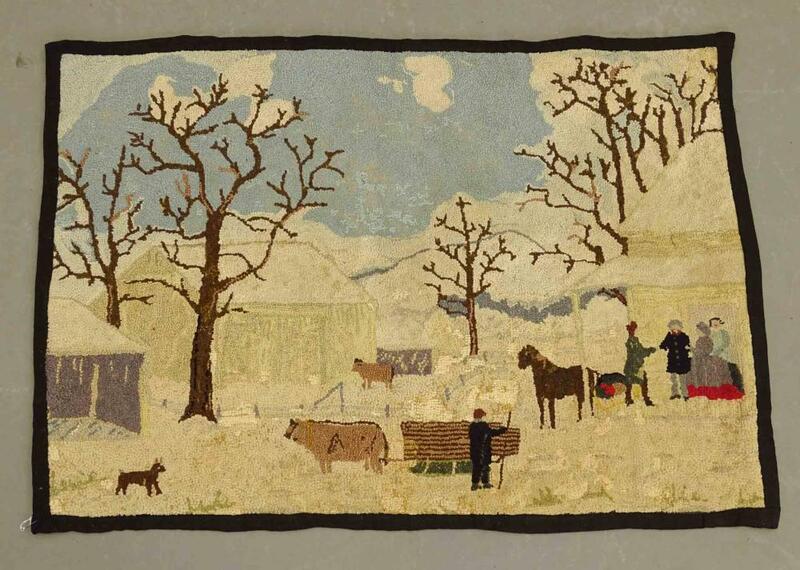 This old-fashioned snow scene is Lot 62, Description: C. 1900’s winter farm scene hooked rug. 28″ x 40″. Well, it’s been a while, but our Tuesday rug group was cancelled, so I am officially snowed in, and happy to not have to go anywhere! 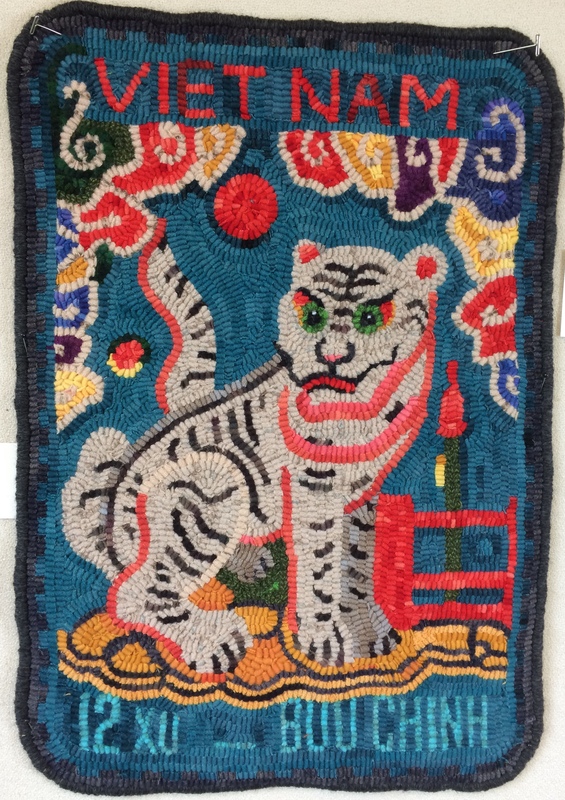 Let’s look at a few hooked rugs that are in the auction sales these days! 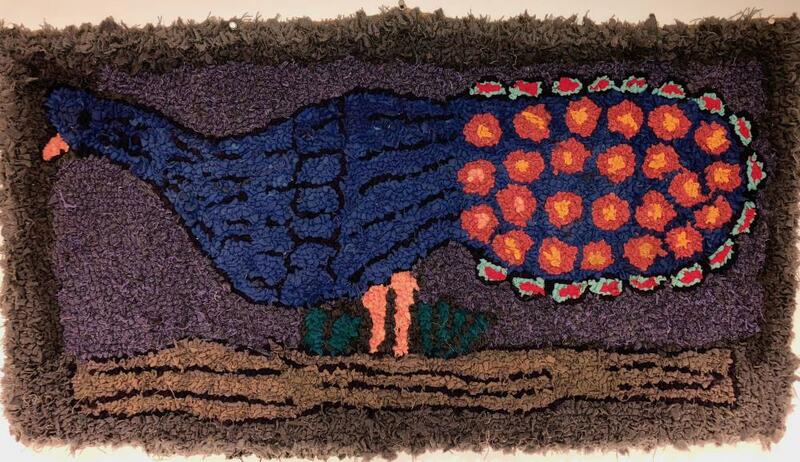 Thanksgiving is on my mind, and when I saw it, I thought “Great folk art turkey!” but the label from Kensington Estate Auctions, in Clintondale, NY, says Lot 150: American Folk Art Pictorial Hooked Rug PEACOCK. There’s no other info on who, where or when, so maybe they just decided it was a peacock! At any rate, it’ll be auctioned on Dec. 3 (7pm) and the estimated price is $200-$400. 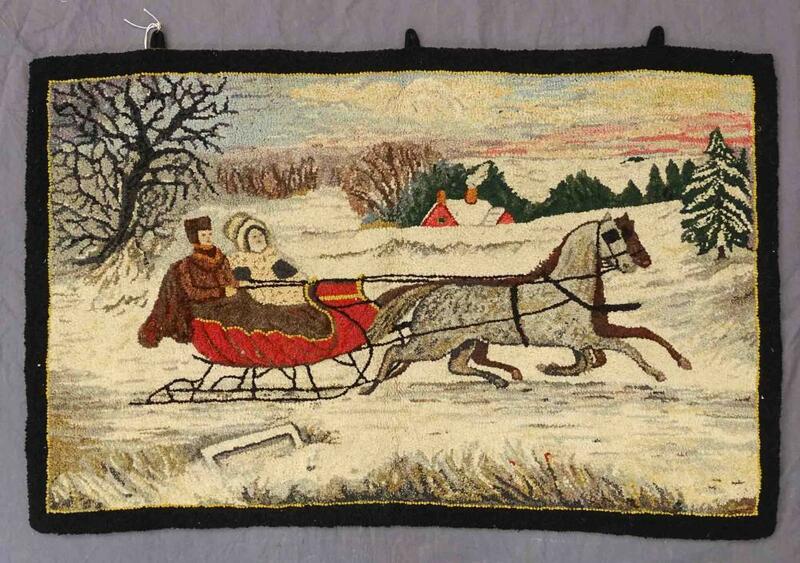 A friend of mine is hooking a different Currier and Ives snow scene, and to me, it looks really, really hard! Not only because of all the shadings of the snow, but making snow on bare branches look right, and trying to get the blue tint to everything that was so characteristic of many of these classic snow pictorials. This is Lot 60, and the estimated price is $75-$100. Description: C. 1900 floral hooked rug. 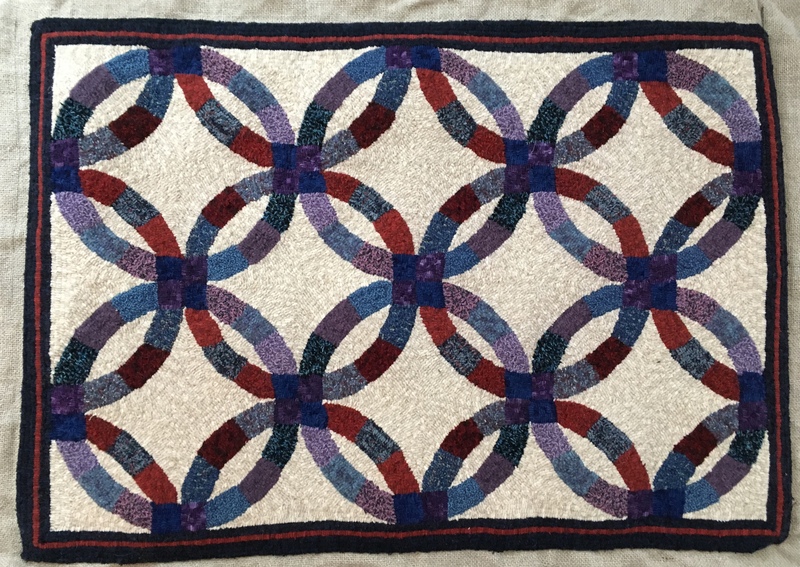 30 1/2″ x 50″. 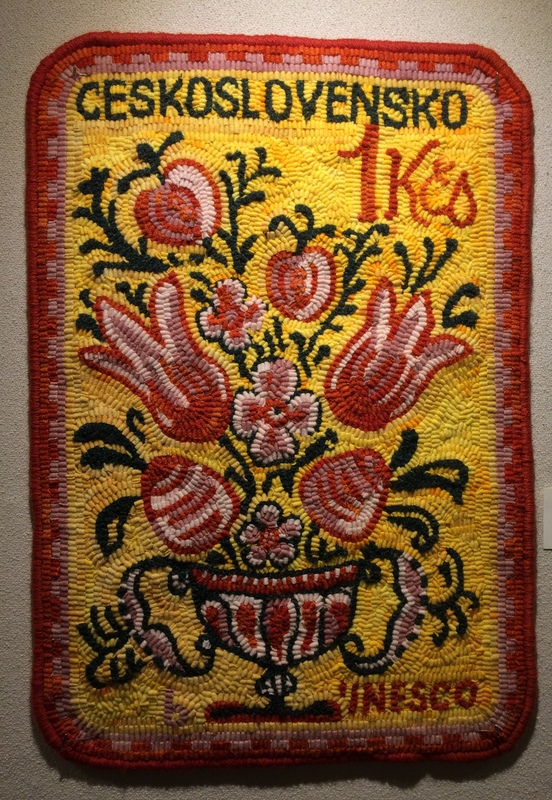 While it looks a little primitive compared to the very fine shading in many flower and scroll rugs we see today, someone put a lot of work into this, and the colors, to me, just say “Thanksgiving”. It is, of course, the traditional Double Wedding Ring quilt pattern. After studying a lot of photos of this pattern, I cut out my own circular template from a piece of cardboard, using a dinner plate and salad plate, and just went from there. As soon as I post this blog entry, I will go steam it! From my house, with all of us inside as the snow is steadily falling, to you and your families, whether traveling or at home, a very happy Thanksgiving to you! Hats Off To Stories Shared! In late 2015, rughooker Kris Burnett was contemplating her retirement after 20 years as a librarian at the Howe Library in Hanover, NH. She got the idea to do some hooked wallhangings using the look of vintage postage stamps as a unifying design element. 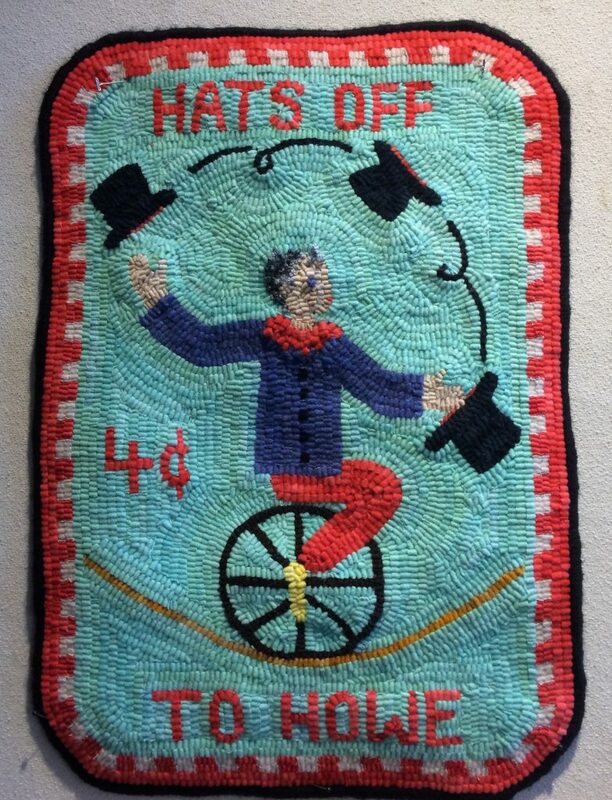 Above, you see her rug Hats Off to Howe, based on a 2010 Netherlands circus poster, and adapted to be a self-portrait. As you will see, Kris’s rugs, with all their fine detail, are impeccably crafted. 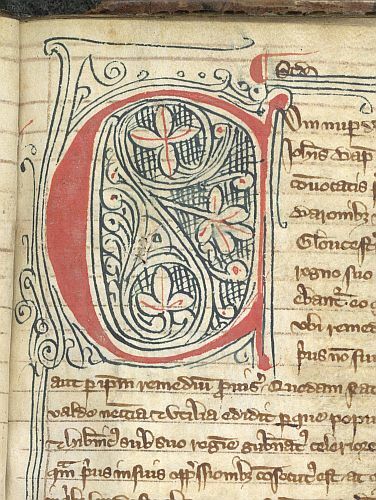 She makes it look so easy to get all that fine lettering (in a foreign language, yet) looking perfect! 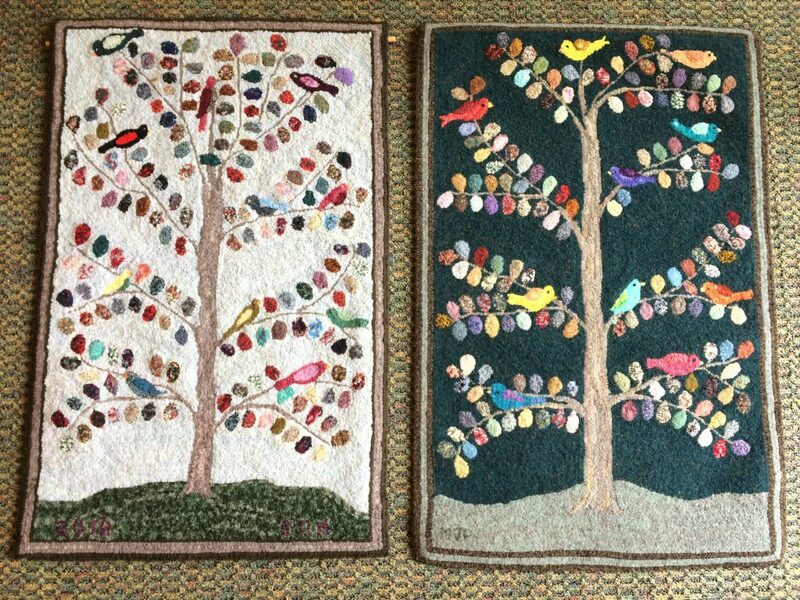 And the composition of her designs is so good that you don’t even notice it – each rug just looks naturally balanced. So she started planning. About thirty rugs, with the hope to be finished in three years time, to coincide with her retirement date in August, 2018. Yes, she did worry about the stamina it would take to produce more than thirty individualized rugs for her co-workers, but she did it. What a wonderful undertaking! 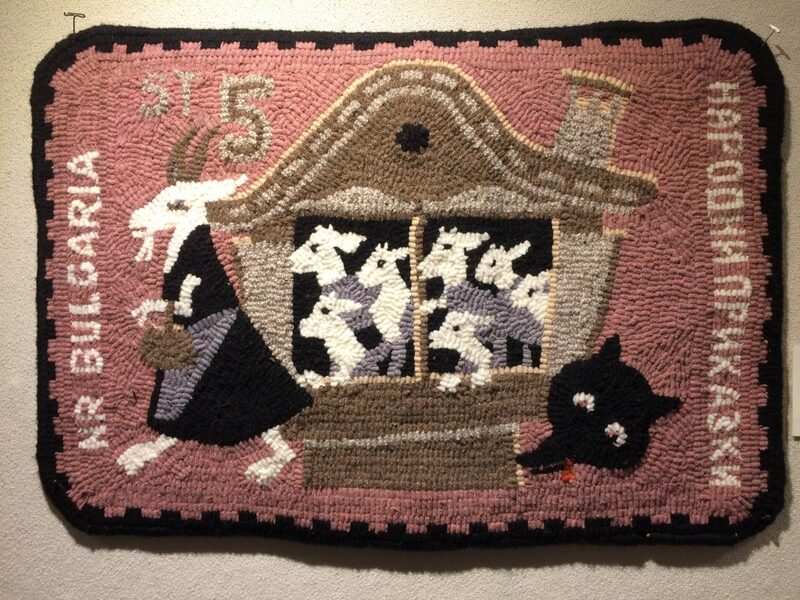 Kris’s exhibit of these rugs is now on display at the Howe Library in Hanover (through October 3rd), and if you are at all close by, it’s well worth your time to go see these 35 rugs before they each go to their new homes with Kris’s workmate friends. Kris, I am so inspired by the creative vitality of your rugs, and so happy that they are – for the next six weeks – on display all together! And mostly I am moved by the wellspring of friendships that must have sustained you through making each of these pieces as your gifts of thanks! The Howe Library website is here, with hours and directions. Try to get there before October 3rd! All images are used with the permission of Kris Burnett, and many thanks to her for letting me show them here! Tonight I am flying to England. I will spend a week at Christ Church (that’s the name of the college) in Oxford. The graceful Tom Quad is pictured above. And what will I be doing there? 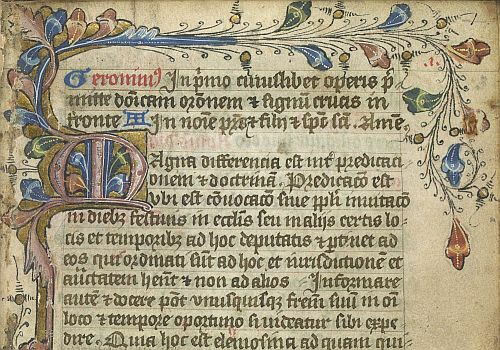 Taking a one week class in medieval illuminated manuscripts. I have always loved seeing them, but know very little about them, so figured it would be a good class choice! 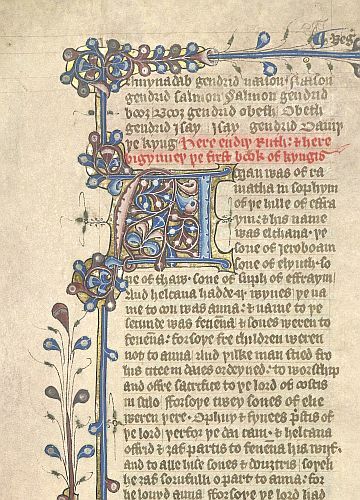 This is a page from the Old Testament, created in England in the first half of the 15th century. I have packed a small sketchbook and a few drawing pens, just in case I want to try out reproducing some of the simpler elements I see… you never know what something like this will lead to! Well, I will know more about these manuscripts before the coming week is out, and know absolutely that my time at Christ Church will be magical, and will go by fast! All these examples are from the collection of the British Library. Stay well, and hook on! Through the marvels of the internet, and one link leading to another, I somehow came across this painting, above, by Ugo de Cesare. What a wonderful work of art! Look how the hard, square lines of the piano, the music sheet and the back of the little girl’s chair set off all the rest – everything else is curved, soft, and rounded. Look at how the two girls (surely sisters?) are arranged to form a rough triangle on the canvas. And the focus of both girls’s attention is so interesting. 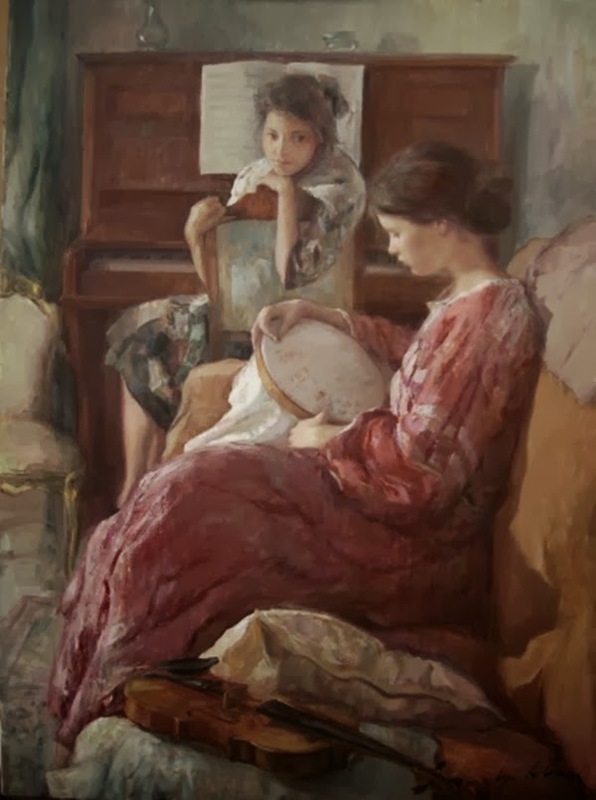 The older girl is so concentrated on her needlework, while the younger one is so focussed on her big sister. 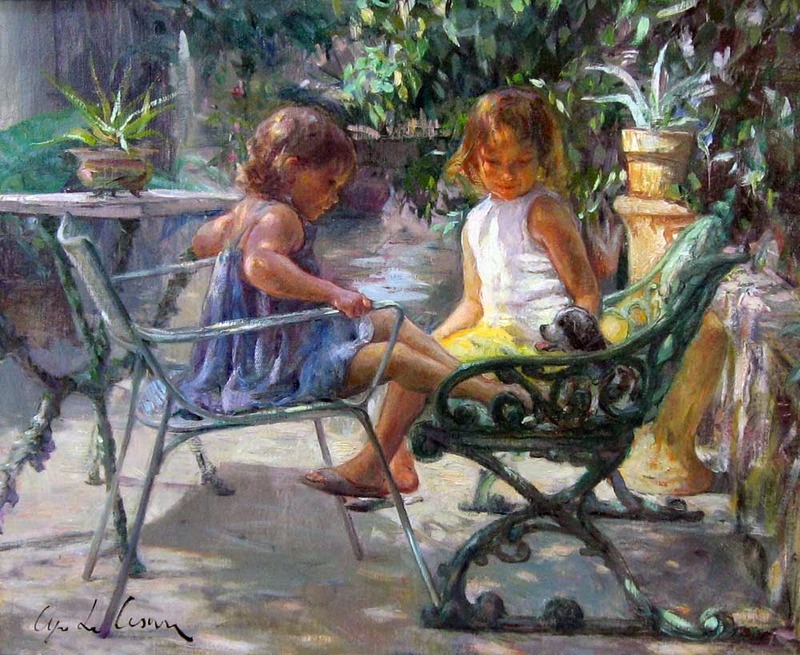 Having three older sisters myself, I remember well looking on at their accomplishments, watching the things they could do well that I was still a beginner at. So as well as admiring the painting, I found something quite true in the relationship between these two girls. Lovely! It is oil on canvas, and titled Music and Embroidery. So I looked up Ugo de Cesare, and was expecting to find something like “Italian painter, 1835-1900”. Well, I was right about the “Italian painter”, but he was born in the same year I was, 1950. He is our contemporary, and lives close to Naples, Italy. There is something so classicly beautiful about his work, and for me, there is an emotionality that shines through. 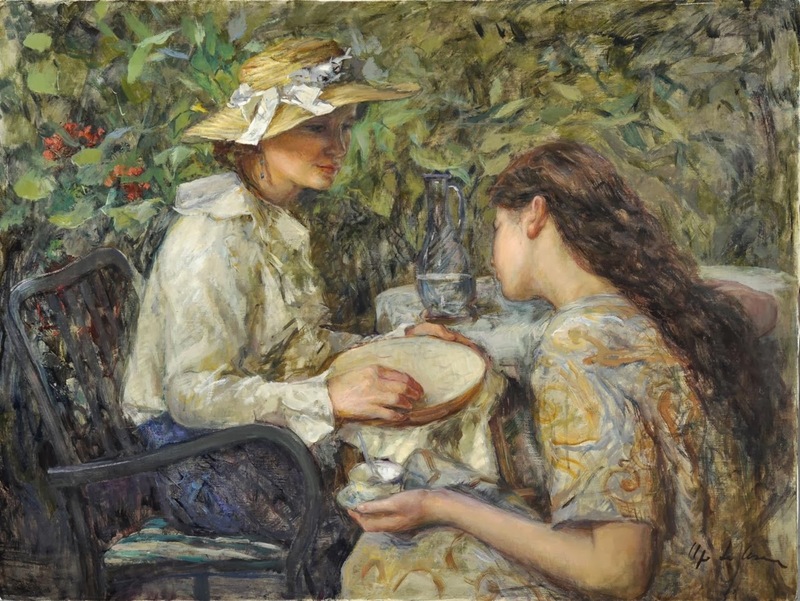 Here is another oil painting by de Cesare that I liked just as much as the first one, titled In The Garden. Are these the same two girls? I wonder if Ugo has sisters? Look at the embroiderer’s blouse, and all the subtle color shading that have gone into painting this “white blouse”. And if you look at the girl’s hat, and how it shades her face, you can determine just where the light is coming from. And that foliage background! Wouldn’t you be pleased to get that effect in a background? And the nicest part of coming across this wonderful artwork? Ugo is on Facebook! I contacted him (in English) asking for permission to show his work, and he wrote back quite promptly – in Italian. Thank goodness for Google Translate, but even I could understand his “thumbs up” icon! 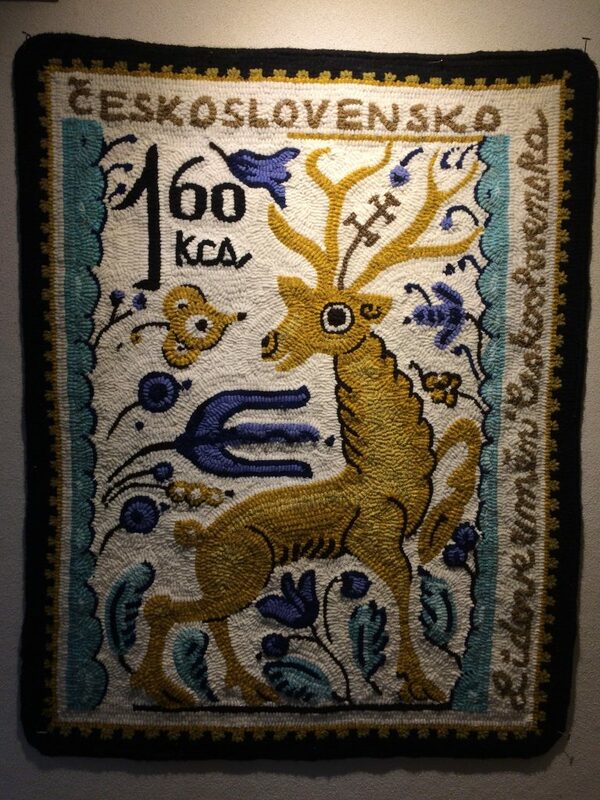 And later in the day, he even sent several “likes” for my rugs that have shown up on my own facebook page! So beyond feeling inspired by his wonderful paintings, and being able to thank this living, breathing, talented painter personally for his lovely artwork, tonight the world seems a little smaller, a little less harsh, and a little more friendly. 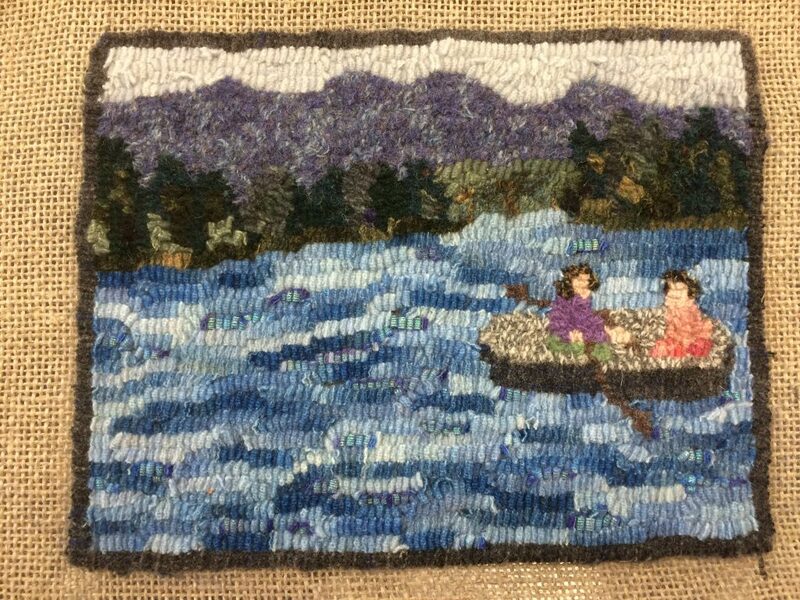 I was at rug camp, and figured on the first day I would work on doing a “New Hampshire Postcard” for our guild’s challenge. 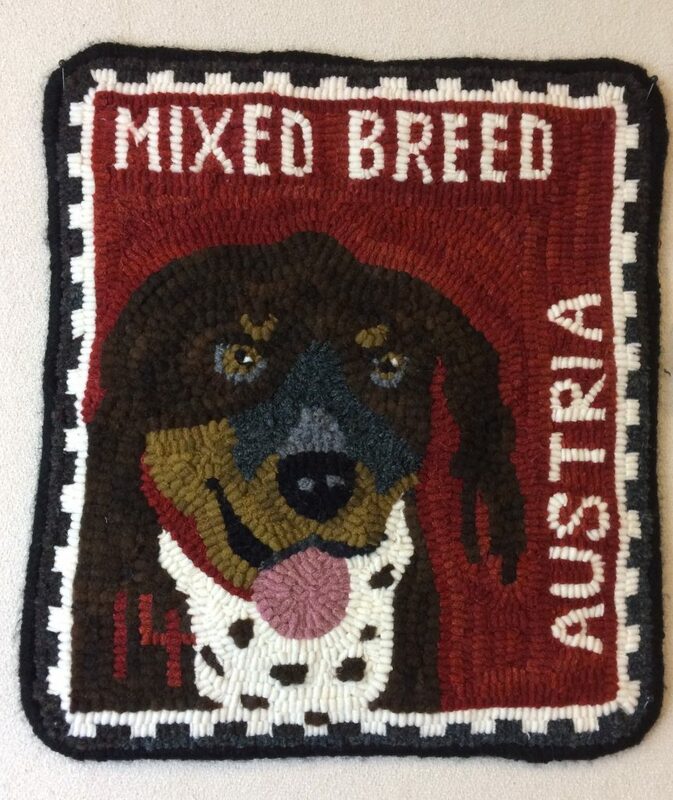 The “Postcard” could be any image that resonates NH to us, but had to be either 6”x8” or 8”x6”. It’s for an exhibit we are planning. I chose a mental image of my sister and I, rowing around in our little dinghy up at the lake. 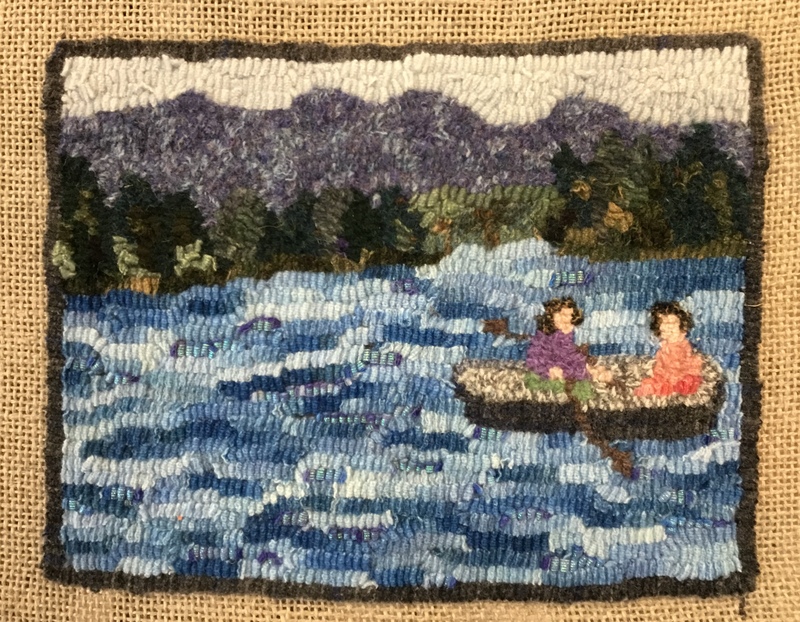 I decided on this image partially because it resonated deeply as symbolic of our growing up in NH, and I thought that after the exhibit, it would be a little piece I could give to my sister, who I know will love it. 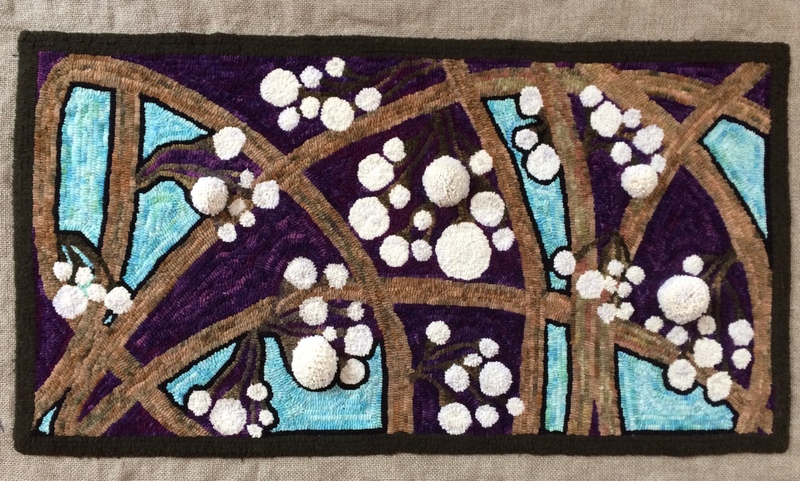 I really did get it done in one day – because I worked on it in a class, where we were all hooking all day long – and because it was a tiny 8”x6” piece! 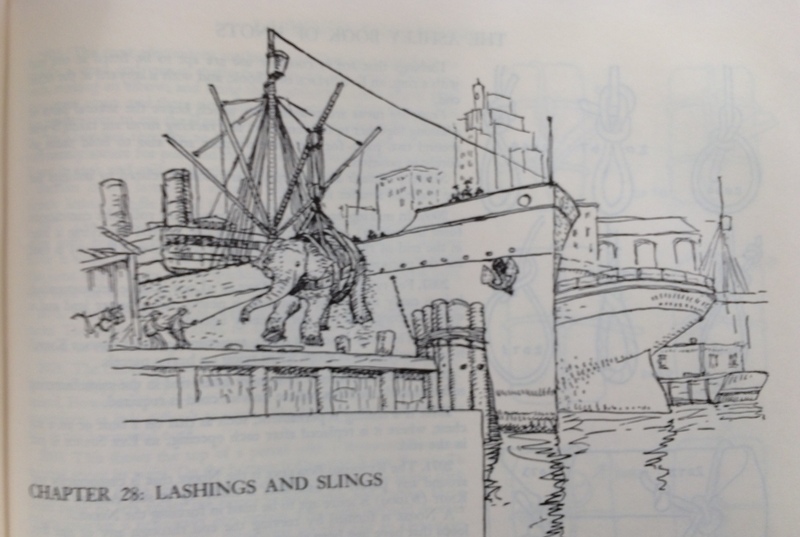 I was pleased with it – everyone could tell it was two people in a rowboat. But I took a picture of it, and looked quite a while at that. And then the next morning, looked again at my little “finished” piece. It needed a little fine tuning. 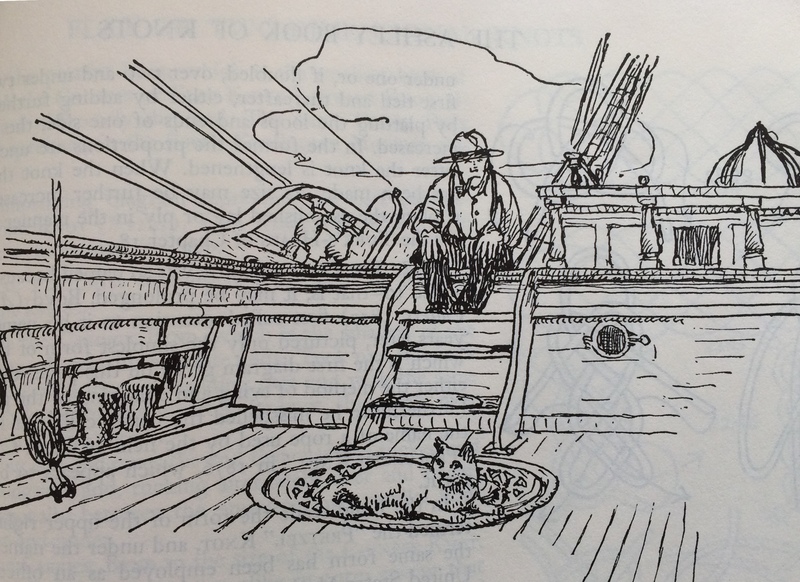 The dinghy was too wide, it looked more like a tub. And the faces, small as they were (only 4 or 5 loops each), could be better. Should I leave it be, or start in on it again? As much as I hated to start messing with it (afraid, of course, that I would be messing it up, not fixing it), I started in on replacing maybe 50 or 60 loops in all. 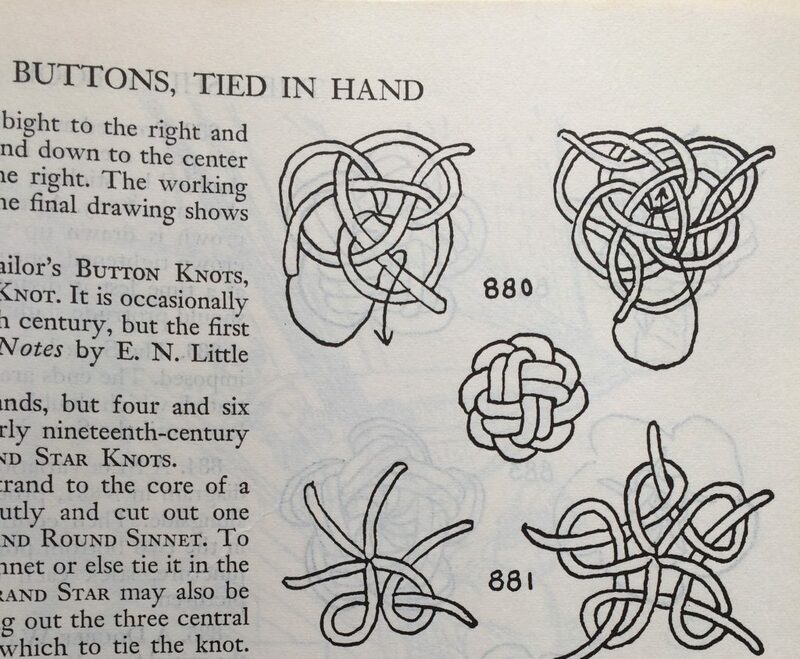 And those final loops made it much, much better. First thing next morning, I took out one row of loops on the top far edge of the boat, replaced it with blue “water” loops, making the boat one row of loops narrower. And replaced the first row of gray “boat edge” loops with a slightly darker gray, to give it more of a defined top edge. I was pleased at the improvement. OK, now I was done! I worked on another project for the rest of the day. Then I looked at this little piece again, especially at the far shore. I wanted there to be two points of land to the left and right, and a much more distant shore in the middle. It was ok the way it was, but I decided to live brave, and try to get that middle shore looking like it was further away. I replaced the trees in the distant middle shore with greens much lighter than I had originally used. Better. 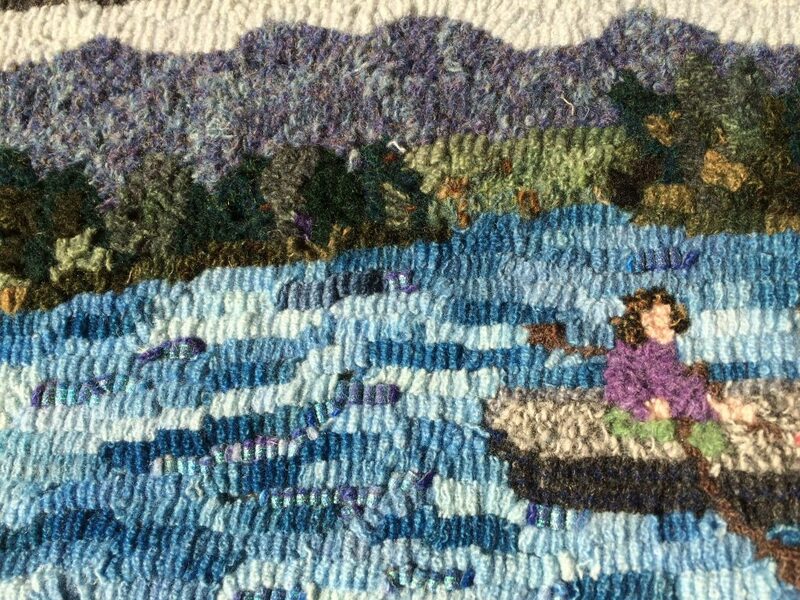 And then, thinking about how the lake looks darker blue at a distance, I changed the wool I had used just in front of that middle “far shore” to a darker blue for the more distant water. So now I am really finished. The moral of this story is that when you think you are all done with a piece, set it aside for a little bit, and look at it one more time. 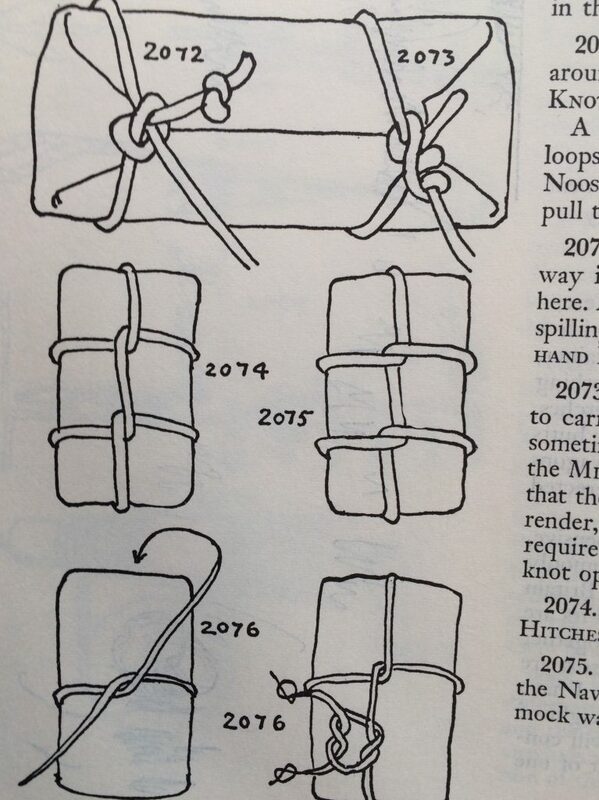 You know I am not a big believer in “reverse hooking”, or tearing loops out on a whim. But as you finish a rug, look for any small details that could be sharpened up or improved, with just the right, very small change here or there. 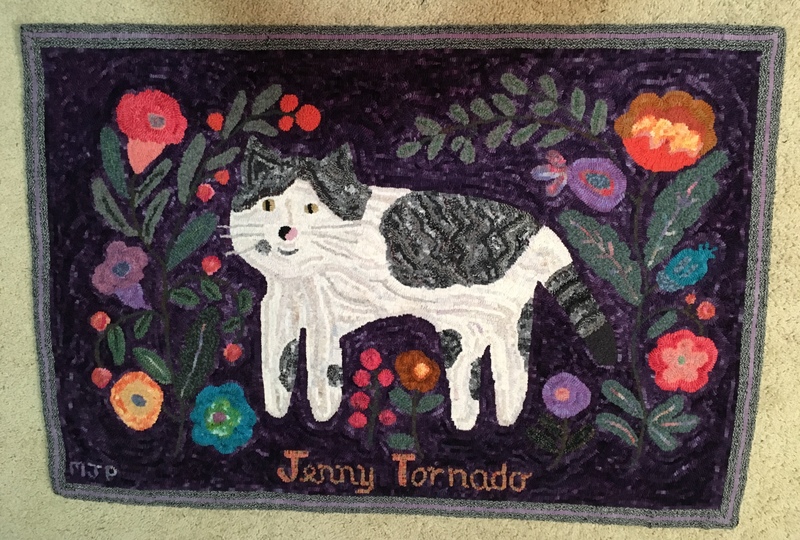 Before you go to the rug finish-line, check if there are 20 or 50 loops that would improve your final piece. I call it Hooking Brave. A little experiment… in looking. Stare at the scene, looking carefully. Then close your eyes for a few seconds. Then stare at the scene again, again looking closely, and then close your eyes again for a few seconds. Repeat this five or six times, and you will have created a permanent image of the scene in your brain. Do you suppose it works? Try it, and let me know! I tried it, and it worked pretty well, but I suppose there is a limit to how much detail in a scene you could capture. 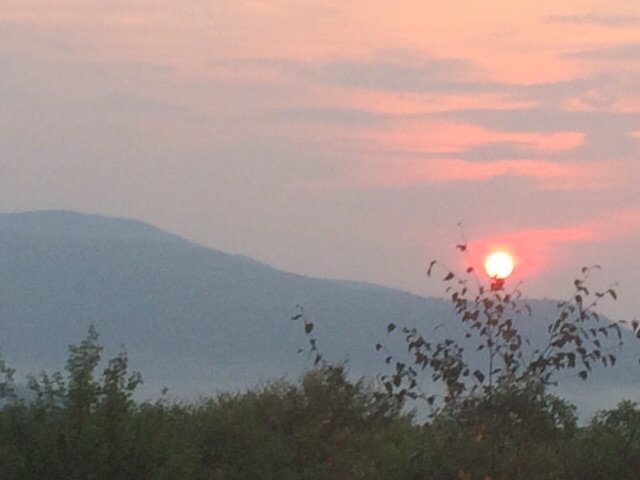 I tried it with the sunrise picture, above, which I look at frequently out my window anyhow. One benefit of then drawing or sketching out the scene from your own memory is that it will now be your version of the scene. The details that were most meaningful to you will be the ones you remember most clearly. 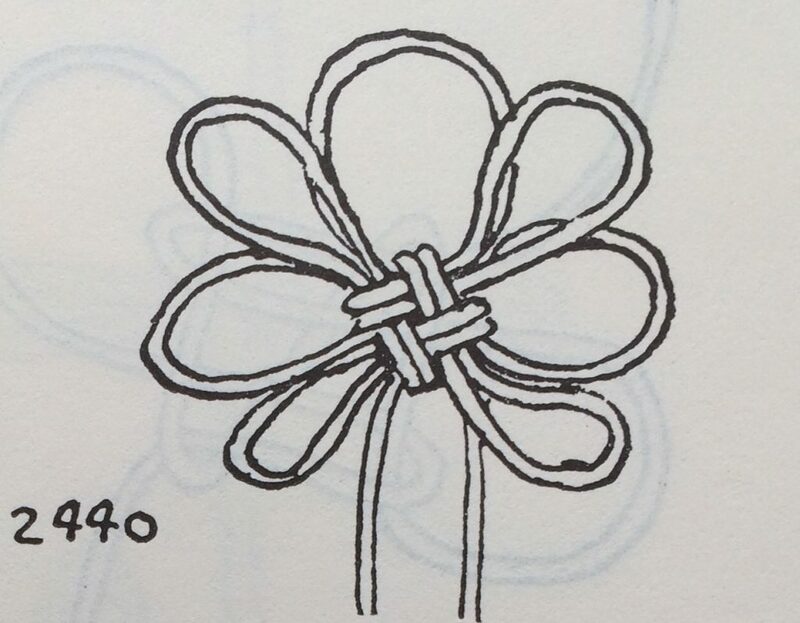 And even if it does not work as well as trying to draw something while it is right in front of you (rather than from memory), it is still an interesting experiment in looking at things more thoroughly and carefully than we normally tend to do, going through our days. Now that I am thinking about this, I do remember a childhood party game we used to play… a number of objects would be put on a tray, covered by a sheet of paper or a towel. Then, on “ready, set, go”, the tray of objects would be revealed for perhaps 20 or 30 seconds, then covered up again. And the winner was whoever was able to remember and write down the most objects correctly. Yesterday I drove by the house my family lived in, from when I was born until about age 6. I was surprised by how close to my vague memory it looked. Yes, the trees around the house were all much bigger, but the house itself was pretty much how I remembered it. I remembered the steep driveway, but was surprised at how much up a hill it really was. But if I had drawn out, from memory, a picture of the house, it would have been pretty correct. Looking carefully and remembering – they are so intertwined. This memory technique really is about “creating an impression”, isn’t it? If you really want to do this experiment, take a photo of your scene first, (or in a pinch, use the sunrise photo I put in at the top), then grab a piece of paper, and after you use this technique to remember a scene, try drawing it out, or at least (“but I can’t draw!”) sketching out a design based on the scene you tried to remember. Send it to me at mjanep@yahoo.com. And we’ll see what happens! Hope you are enjoying the spring weather. I know yesterday was National Naked Gardening Day, but here, it was a little too chilly, and the first of the black flies are out… so that was a no-go here! But I did do a little hooking – hope you did, too! Sometimes our creative instincts can catch us by surprise. 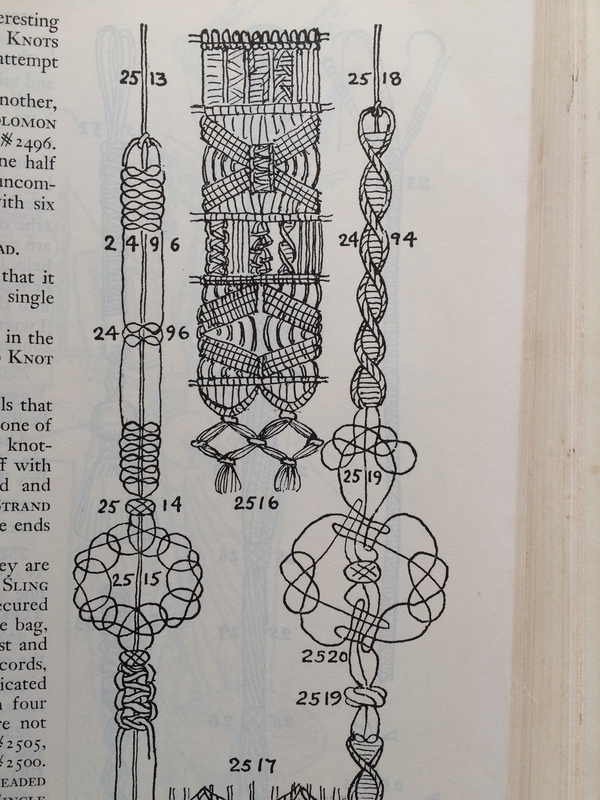 A friend showed me her copy of this book, The Ashley Book of Knots, by Clifford W. Ashley, and I was enchanted! 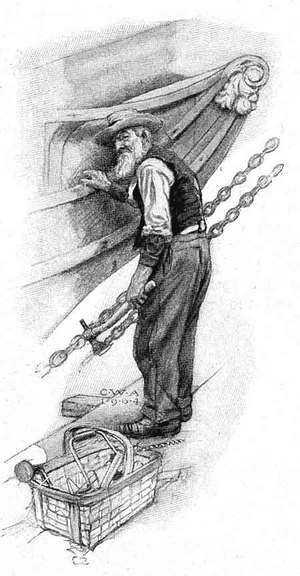 The carving at the bow of the ship, the basket holding the drill, the chain and ax – all are very precisely rendered. 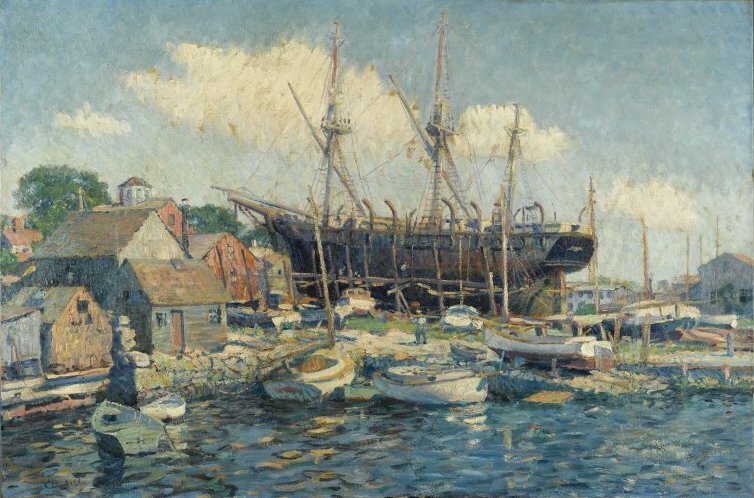 Ashley, born in New Bedford, MA in 1881, went off to sea for several years on a whaling ship, and then came home to study art in Boston. What a change of careers! But actually he used his knowledge and love of the sea throughout his artistic life. That sky! 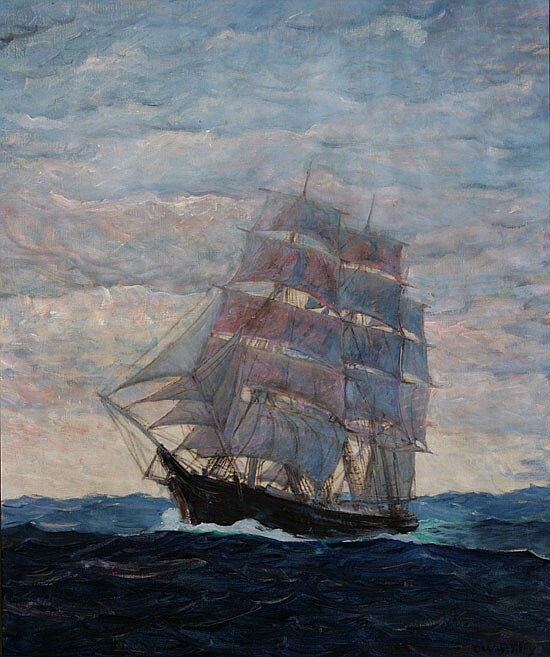 And look at how the colors of his sky are reflected on the sails! Does this have anything to do with rughooking? No, it doesn’t! 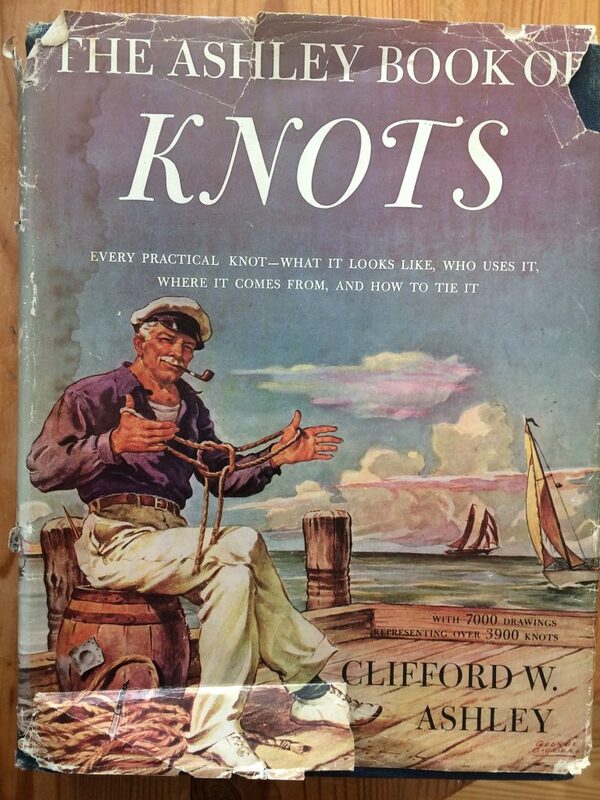 But I just found this man, his paintings and his big book of knots fascinating, so I thought you might, too. 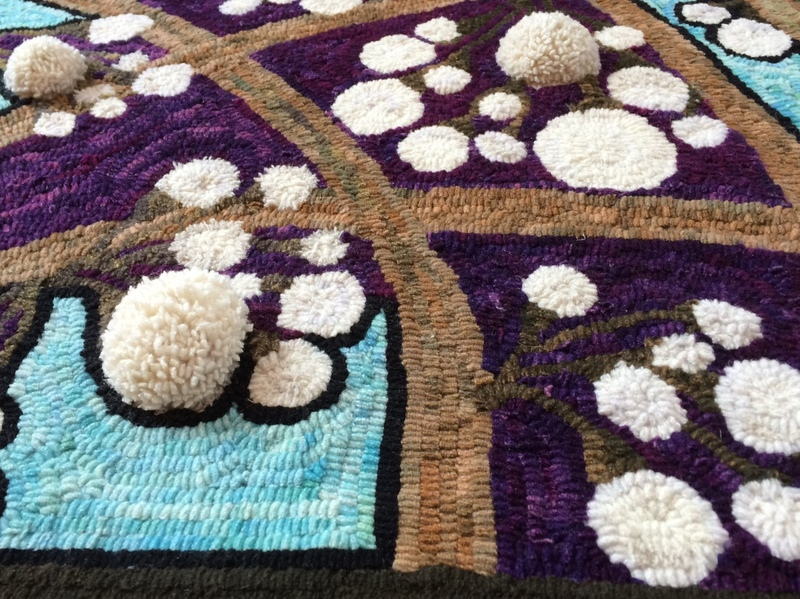 In person, the sculpted pearls do add something special to the rug. 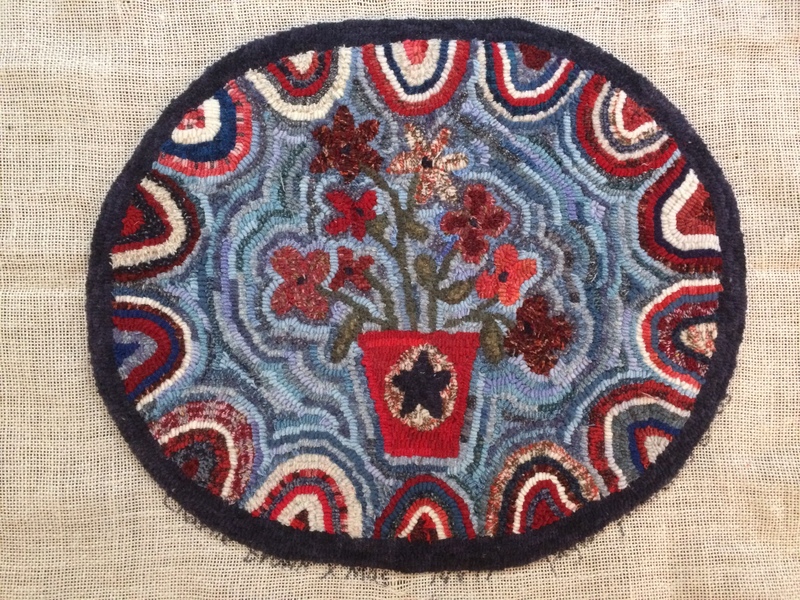 Doing Waldoboro is challenging and fun, but I do not see myself doing a project with lots of it! And starting with such a lovely, graceful design by Lalique, I did not have to worry about the design or the composition itself – just focussed on the colors and the hooking! So now on to my next project! My good friend Sue Hammond (one of the original founders of the Green Mountain Rughooking Guild, and one of the real emotional and creative anchors of our Tuesday morning group) had drawn out a tree, with birds and leaves of many colors. I loved it, and Sue kindly agreed to draw it out again on linen for me to make. So I am working on a Sue Hammond original! I’ve decided to take Sue’s advice and add background to each hooked element as I go along, so there is not quite so much background later on! 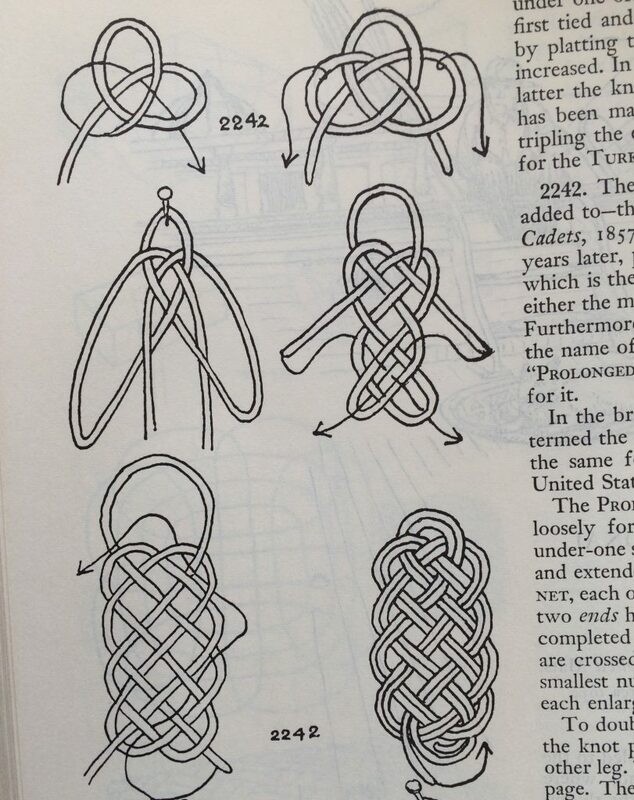 And both Sue and I are already enjoying how our hooking strategies are different. I definitely wanted to do the entire tree first. 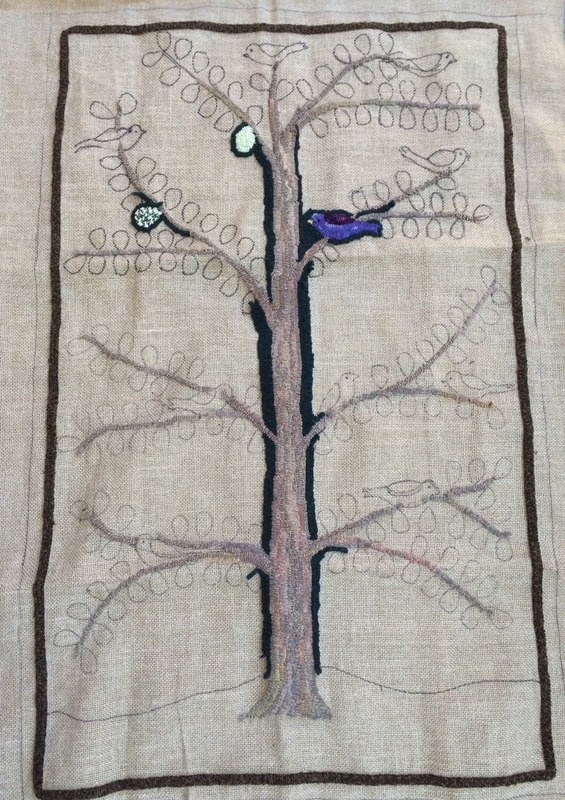 She did one small section – tree, birds, and leaves – all at once, then went on to the next small section. And her background is a very pale blue, while mine is a medium-dark green. It will be so interesting to see them, side by side, when they are both done! Hope you have a good project or three to be working on, during this last cold spell (please make it be the last one!) before real spring arrives.